Giving back is part of Devon Seymour's DNA. So naturally the 2015 WSU graduate stepped up to coordinate student volunteer efforts following the mudslide that devastated communities along SR 530 mudslide in the spring of 2014. Mention community service to Devon Seymour, and the high-level energy radiating from the 2015 graduate of WSU goes up a few notches. Her voice becomes more animated. Her crystal-blue eyes shine bright. She leaves little doubt she cares deeply about the topic. Seymour traces that passion to childhood and the influence of her parents as she grew up in Fort Collins, Colorado. They didn’t give her books about Cinderella, Barbie dolls, or jewelry-crafting kits on her birthdays. No, her parents turned their young daughter’s thoughts and expectations in a different direction—toward community service. Perhaps the moment of epiphany occurred on her 8th birthday, when mom and dad presented Seymour with a book about Madeleine Albright, secretary of state during the Clinton administration, known for her advocacy for democracy and human rights worldwide. Of equal significance to an impressionable 8-year-old, Albright was the nation’s first female secretary of state and the highest-ranking woman in the history of the U.S. government at the time. As Seymour grew older, her parents gradually involved their only daughter in a variety of volunteer activities at church, at school, and in the community. Before she realized it, the act of volunteering was second nature, as natural as breathing the fresh mountain air in her backyard. Stitched together, those early experiences reinforced what is now one of her core beliefs: that giving back is vital to the wellbeing of communities and, ultimately, to society. That belief sustained her during the challenging and sometimes despairing moments following the aftermath of the massive mudslide on March 22, 2014, that ripped through the Stillaguamish River valley along State Route 530 in northwestern Washington, claiming 43 lives. 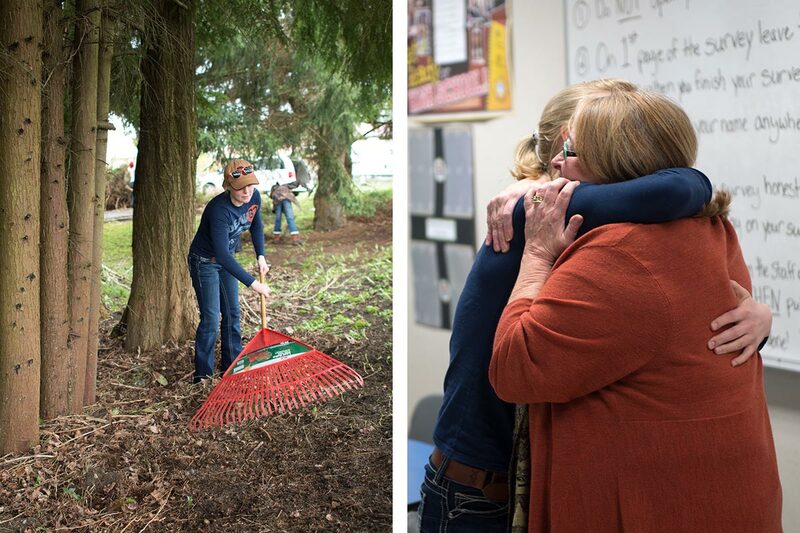 It was in those moments that Seymour’s natural inclination to step up and lend a hand led her to embrace a leadership role in coordinating the Pullman campus’s student response to the catastrophe. It’s a decision that cemented her commitment to spend her life working for the greater good. Seymour’s decision to attend WSU was atypical. It didn’t involve visits to multiple campuses across the country, agonizing conversations with family members about which college offered the best political science program, or even considerations about trips back home during breaks in the academic year. Instead, she identified two criteria to guide her selection process: 1) a college that would provide opportunities to become more independent and 2) a college whose location would remind her of Fort Collins during moments of homesickness. Call it fate, happenstance, or dumb luck, but Seymour chose the WSU Pullman campus as the first destination to visit. It was love at first sight. “I think what really sold me was the advantages the Honors College staff discussed,” she recalls. “They talked a lot about not only being academically successful, but also about the importance of being an active community member, of being a part of something bigger than yourself. Seymour knows her global perspective was limited coming out of high school, with her beliefs grounded in her hometown experiences. She credits the Honors College with broadening that viewpoint by offering a global competency certificate. Participating in a study-abroad program in France also helped push her out of her comfort zone, she says. 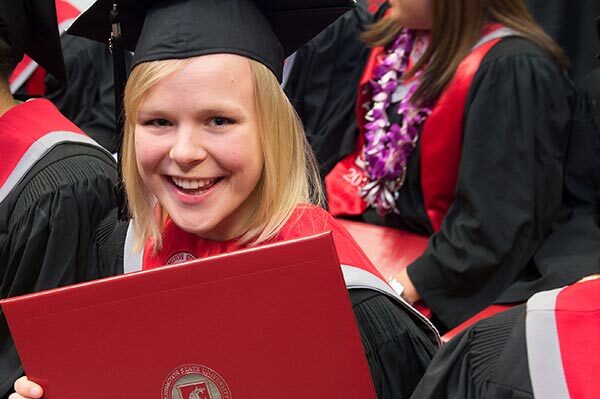 The initial plan was to earn her WSU degree in two or three years so she could move on to the next goal in her life. But once her natural inclination to get involved took over, Seymour found herself being drawn deeper and deeper into the life of the university and the community, an experience she now treasures. By graduation, Seymour had completed degrees in political science and French and minors in communication and business administration, an academic load that required compiling 150 credits in four years. Most students graduate with 120. Earning all those credits is part of a master plan. Political science and French tie into her interest in global politics and prepare her for the likelihood she will live abroad as her career takes wing. Similarly, communication will boost her ability to understand and communicate with locals abroad and business administration will help her understand the economic conditions of other countries. She gives kudos to Thomas Preston, interim director of the School of Politics, Philosophy, and Public Affairs and professor of international relations, for helping her to sharpen her future plans. She took his course on international politics and the media as a junior and attended his graduate seminars this year. Seymour’s resume fills two pages that document an ambitious four years at WSU, emphasizing—as you would expect—community service and volunteer activities. Member, board of directors, Alternatives to Violence of the Palouse. Director of academic affairs for ASWSU, the student government organization. Student ambassador, College of Arts and Sciences. Chair, “Saving the Spokane,” an undergraduate multidisciplinary research project focused on building awareness of PCBs in the Spokane River. Vice chair, Compton Union Building advisory board. The list goes on. But out of all of her activities, it’s the SR 530 experience that stands out as Seymour’s watershed moment at WSU. It was just a few days after the magnitude of the March 22 slide became apparent that the late WSU President Elson S. Floyd began marshaling university resources to help. On April 2, he announced tuition waivers for WSU students from the affected communities. A few days later, a team of faculty and staff from across the university was created to coordinate WSU’s response. By the end of April, summer internships offering opportunities for WSU students to serve in the towns along SR 530 were in place. Seymour jumped in immediately. Given her previous volunteer experiences, she soon was named coordinator of the university’s local fundraising efforts and student engagement opportunities. She worked closely with community liaisons from the affected communities to identify needs. Before long, WSU students were involved in community cleanup, trail maintenance, building repair, and fundraising, among other activities. In the summer of 2014, Seymour organized a dinner and silent auction on campus to raise money to benefit individuals from the SR 530 communities. Held in early September, the event raised $15,000. She followed that up by leading a group of students who completed a service weekend in Darrington at the end of the month. She led a second group of nearly 50 students to Arlington during the last weekend in March 2015, then squeezed in one more trip before graduating in May. For Seymour’s own future—and the ambitious dreams she harbors—the SR 530 experience reaffirmed the direction she’s chosen. Seymour’s long-term goal is to work for the U.S. Department of State. Her dream job? U.S. ambassador or staff member at a consulate. For the short term, she’s set her sights on being hired by the U.S. Bureau of Conflict and Stabilization Operations, an organization that helps resolve conflicts in regions of the world vital to the country’s strategic goals. First things first, though. Following her May graduation from WSU, and before heading to graduate school, Seymour moved in the fall to the French island of Corsica for seven months to teach English to French students. The opportunity is part of a joint initiative of the French Ministry of Education, the Centre international d’etudes pedagogiques, and the cultural services department of the French embassy to strengthen English-language instruction in French schools. More than 1,100 American citizens teach in public schools across France each year through the program. For Seymour, the experience provides an opportunity to put her French language skills to practical use while experiencing French culture, connecting with the people, and deepening her understanding of world politics. 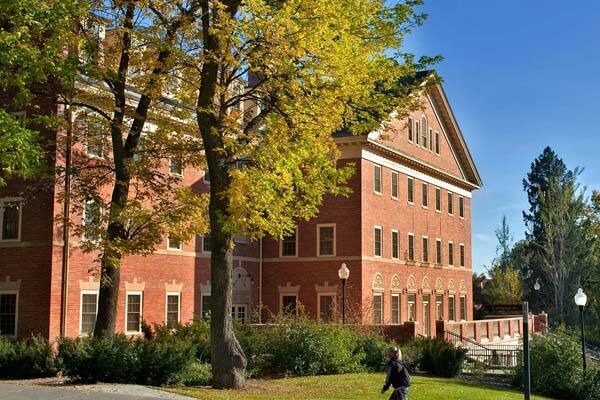 Next, Seymour will pursue graduate studies at the Maxwell School of Citizenship and Public Affairs at Syracuse University, the nation’s top-ranked graduate program for public affairs, according to the U.S. News and World Report college rankings. There she’ll complete joint master’s degrees in international relations and public administration and complete an internship abroad. It’s a future that would make Madeleine Albright proud.